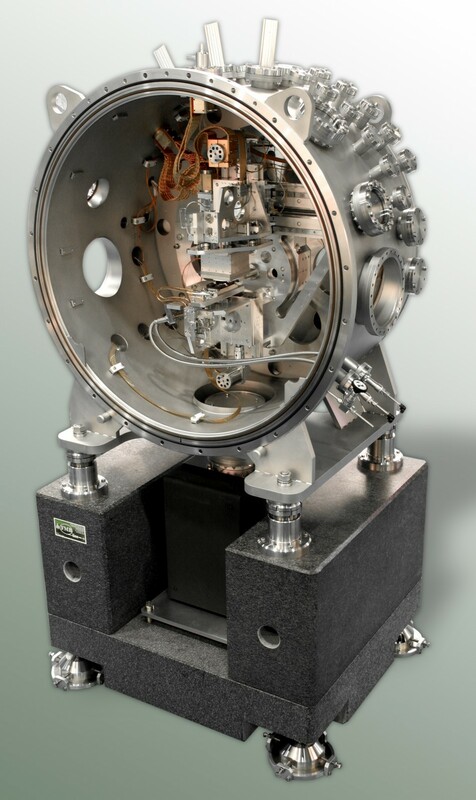 3 pieces of water cooled Double–Crystal–Monochromator with 2 crystal pairs. 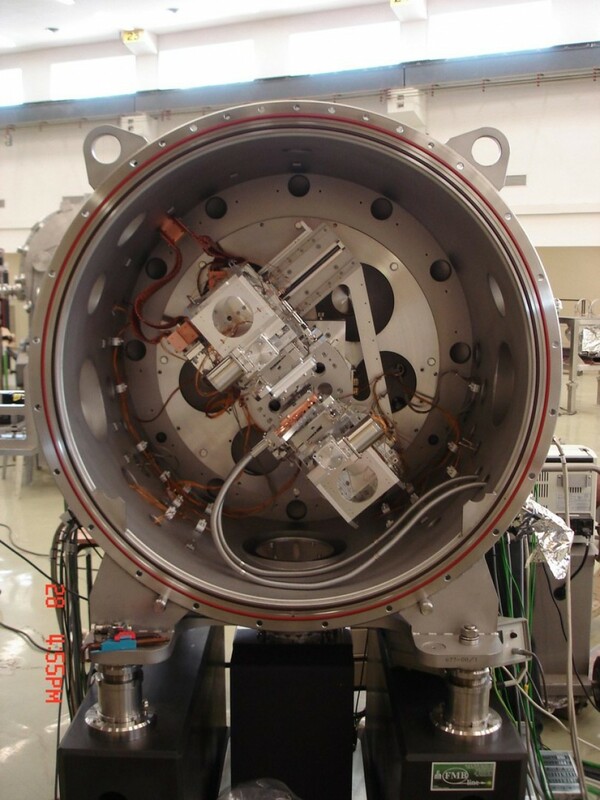 The DCM will be incorporated into a beamline with a horizontal incident beam. 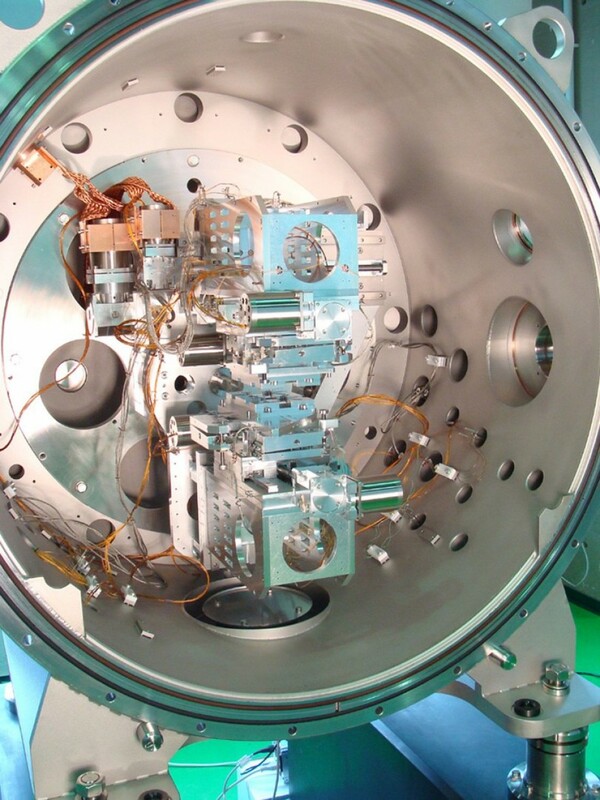 It will use two parallel crystal pairs in (+, –) configuration to produce a monochromatic exit beam which is running parallel to the incident white X–ray beam. When Si (111) crystals are used the energy of the monochromatic beam will be continuously selectable from 3 keV to 20 keV. The energy will be selected by rotating both crystals (varying the Bragg angle) whilst keeping the crystals parallel to each another. 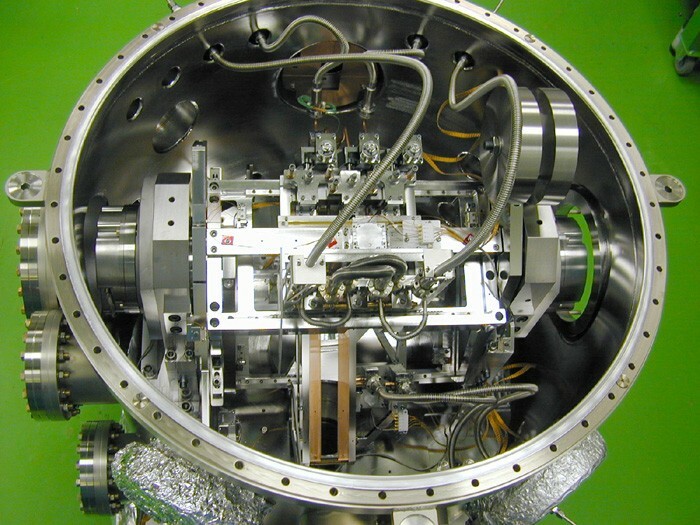 The beam offset, i.e. the distance between the optical axes of the incident beam and the exit beam, does not change during the energy scan. This is realised by a common rotation of both crystals and two perpendicular motions of the second crystal. 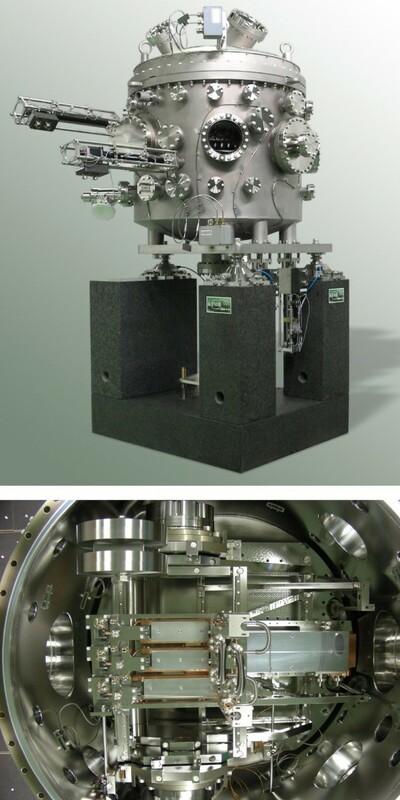 The DCM is designed for a beam offset between 40mm and 46 mm. Different beam offsets are available on request. The Bragg angle can be set between –3° and 50°. In the 0° position (horizontal crystal orientation) the first crystal can be moved out of the Bragg rotation axis to let the beam go through. 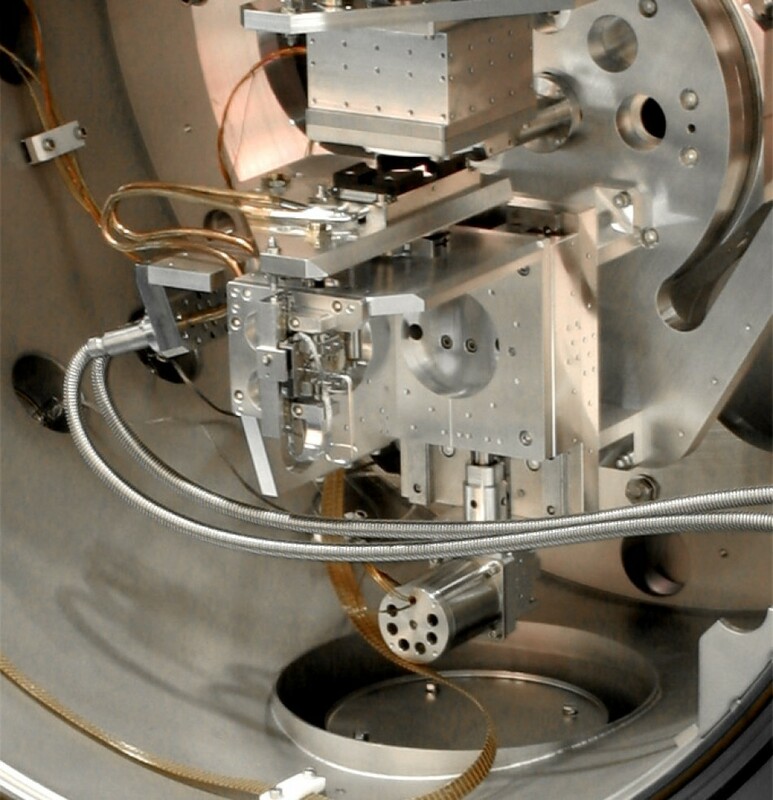 The DCM is high–vacuum compatible. 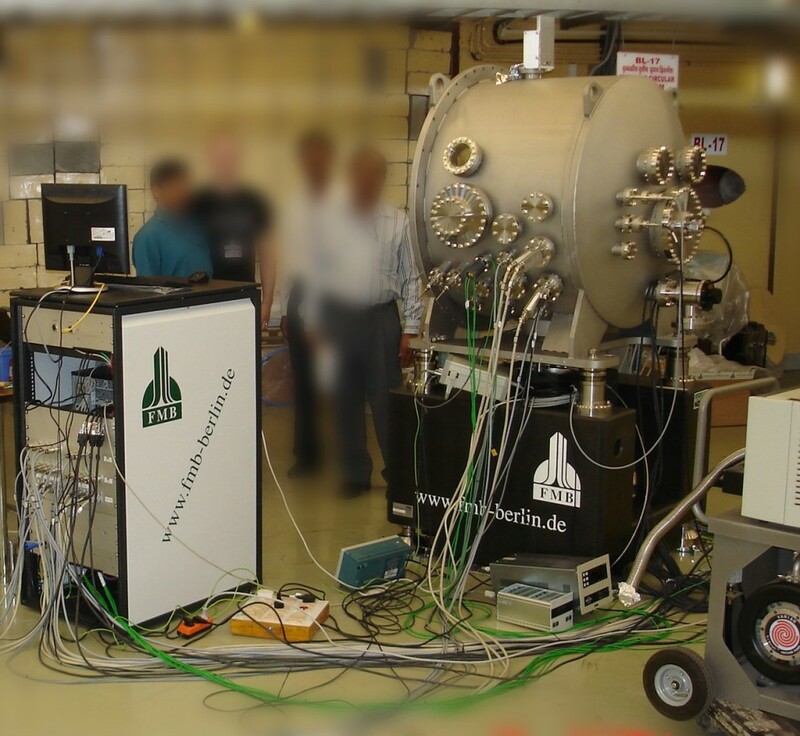 The first crystal is indirectly water–cooled in order to dissipate the absorbed photon energy. The DCM control system is mounted in a single 19”–24U control rack. It includes a control PC running on Microsoft Windows XP. The control software based on AgilentVEE provides a graphical user interface. 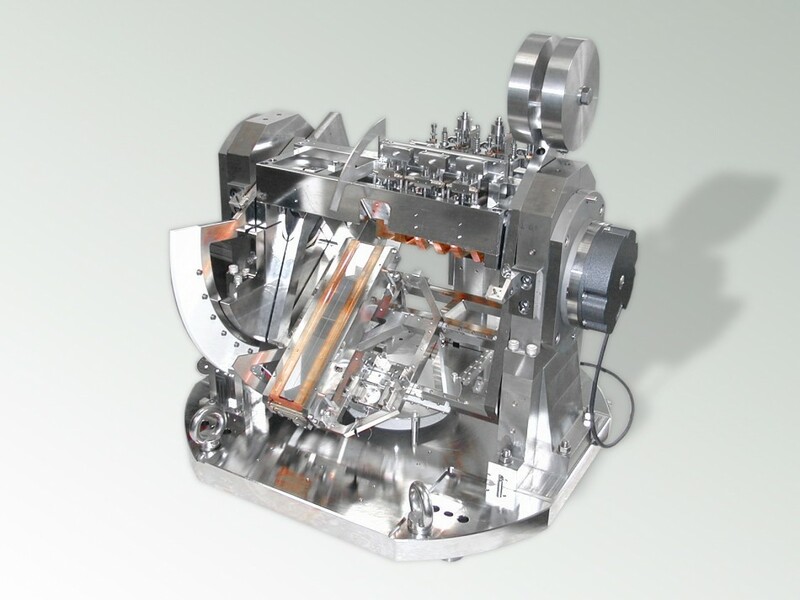 It is the task of the monochromator to realize the necessary pitch movement of the gratings and of the mirror as well as to guarantee the exchange of the gratings and of the mirror. The gratings and the mirrors are arranged separately in highly precise and stable supports which are equipped with fine adjustment facilities. A normal incidence mirror and a normal incidence grating are used for the lower energies. The gratings are oriented towards the bottom, while the mirror surface shows upwards. 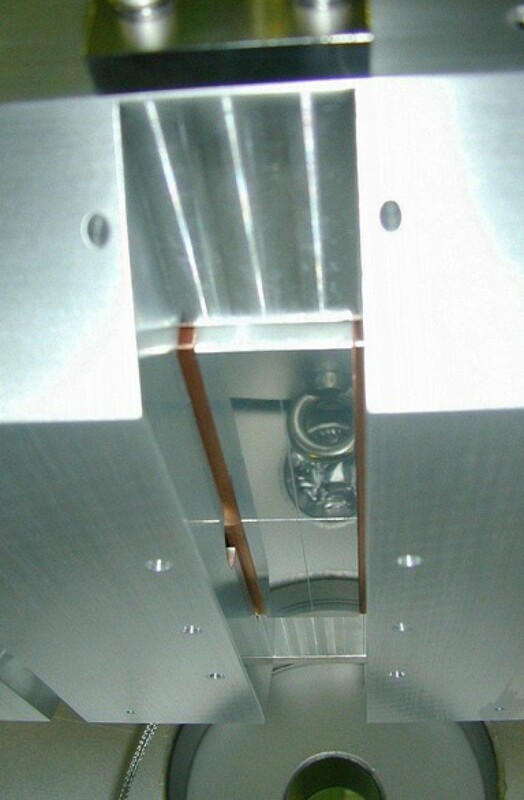 The gratings can execute a pitch rotation up to 55°, the mirror has an angle range of 35°. The exact positioning of the grating surfaces in the rotational axis is important. High–precision hybrid ball bearings will be used as bearing mechanisms. For the exchange the gratings and the mirror travel in separate linear slides. 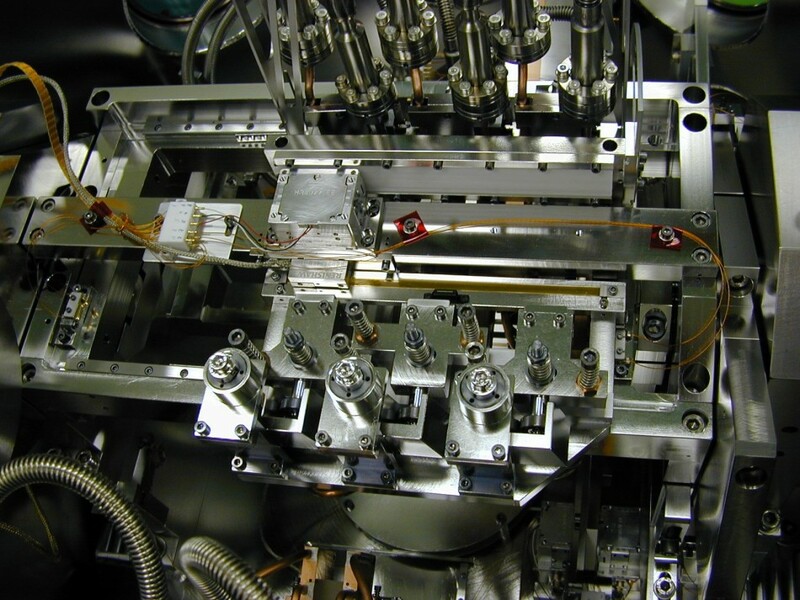 The exchanging positions are read via linear encoders, which can be operated in the vacuum. 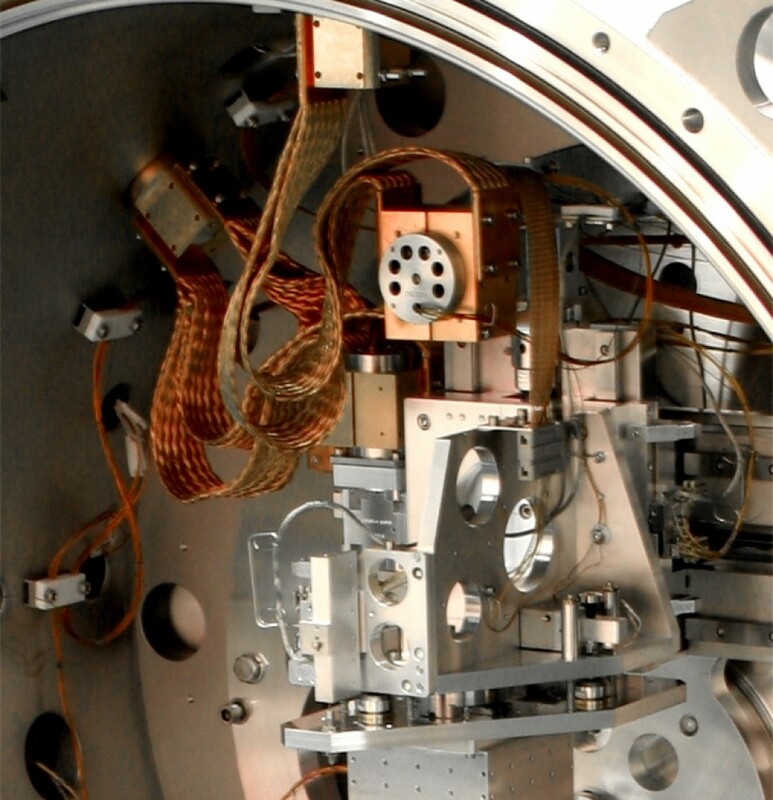 The pitch positions are determined using high–precision angular encoders, which are mounted directly on the axes in the vacuum. 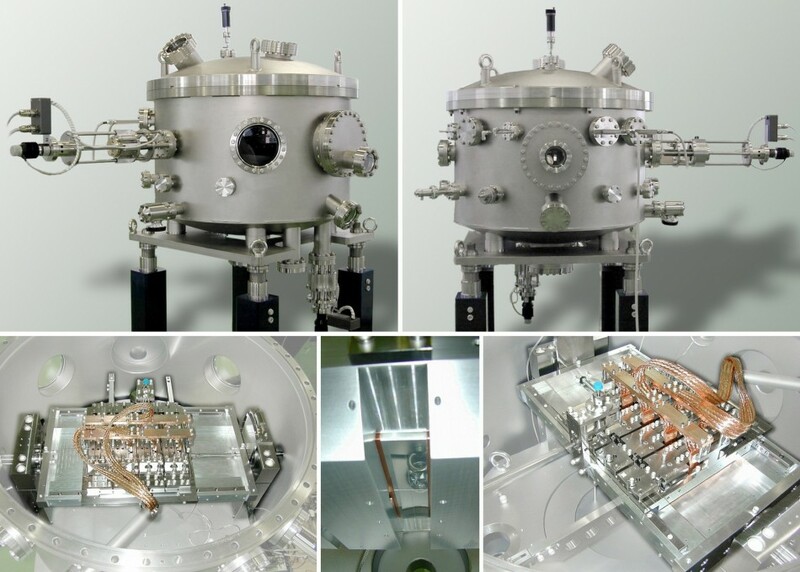 The entire mirror and grating mechanism is based on a very stable base plate which is screwed to feet which come from the outer main frame and are led through the chamber wall. 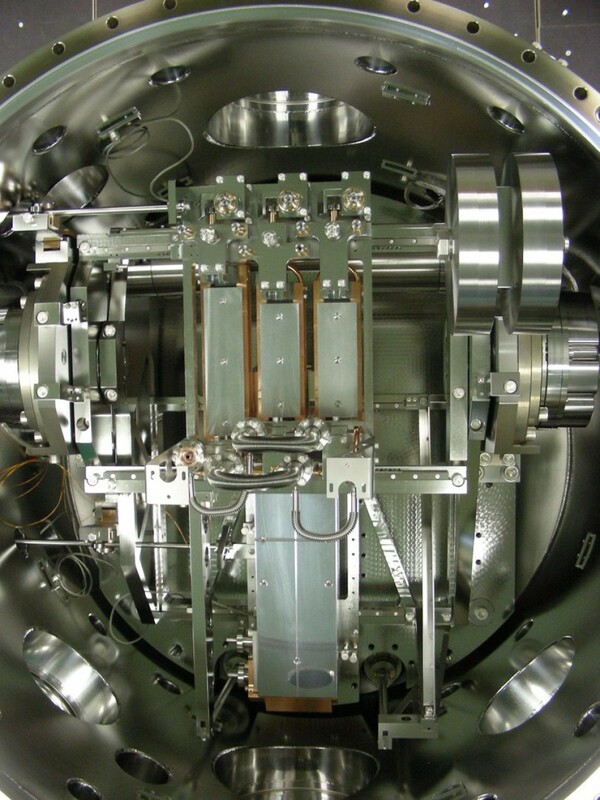 Thus the mechanism is not connected with the chamber and is isolated from thermal and mechanic deformations of the chamber. 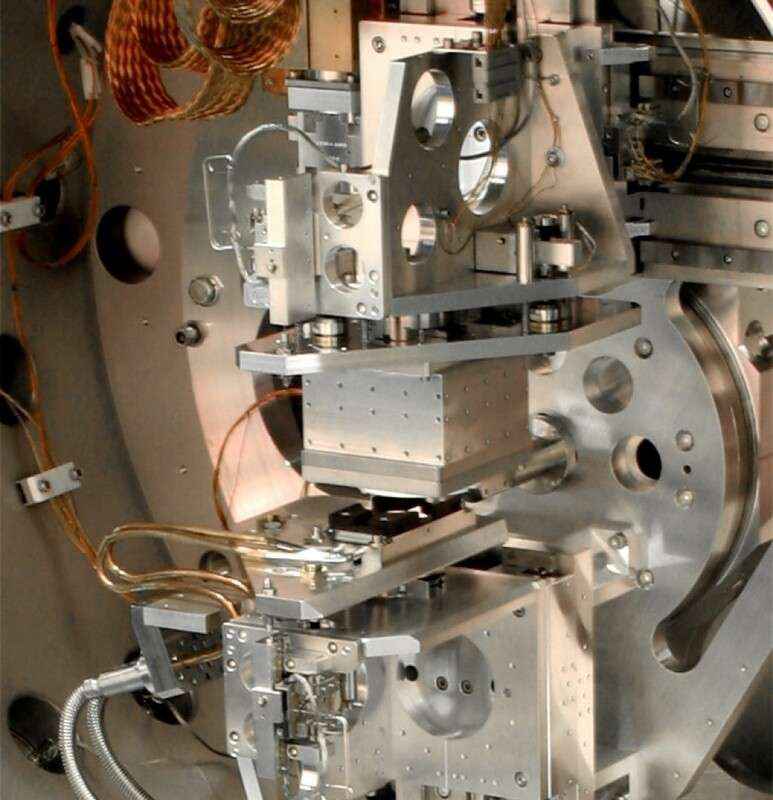 The monochromator frame consists of solid pipes or a monolithic block and allows an adjustment in all six degrees of freedom. 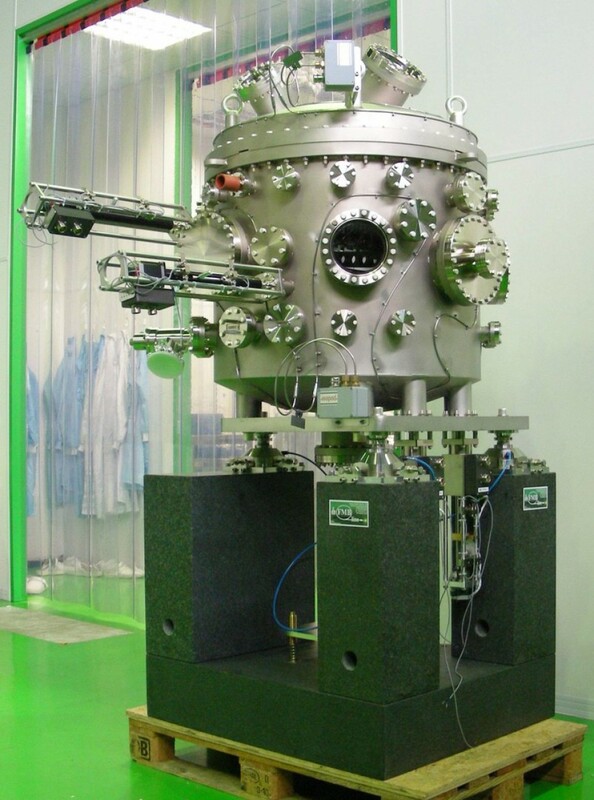 A sputtering ion pump is used as a vacuum pump. 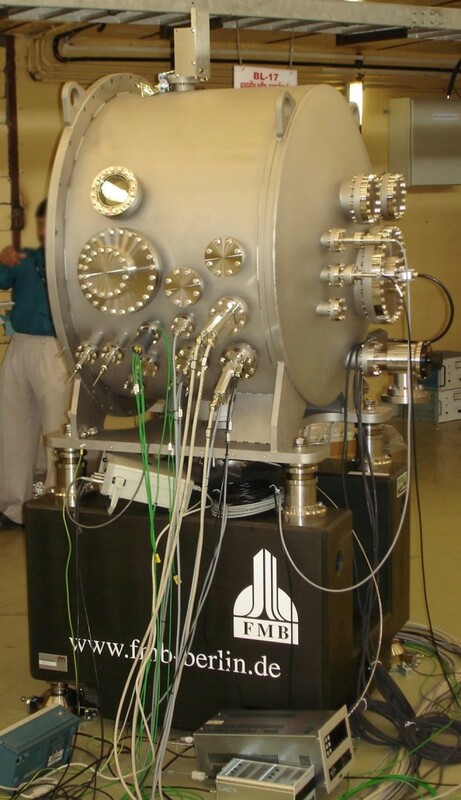 The vacuum chamber has a diameter of approx. 800 mm and is completely metal–sealed. 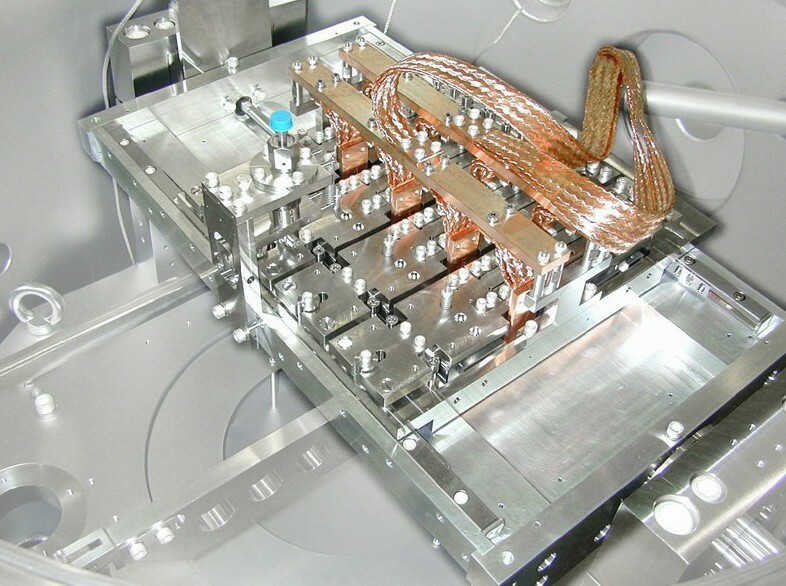 All optical elements are fitted with lateral cooling plates. 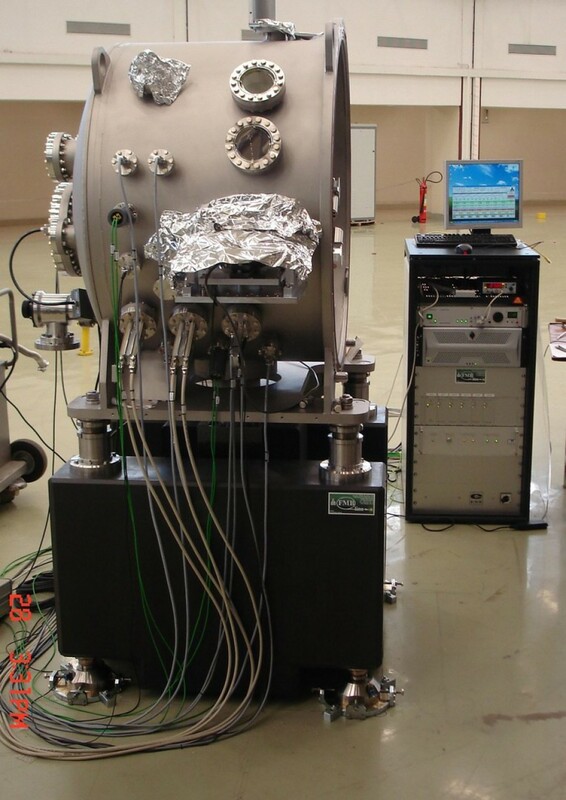 Cooling is performed using water. 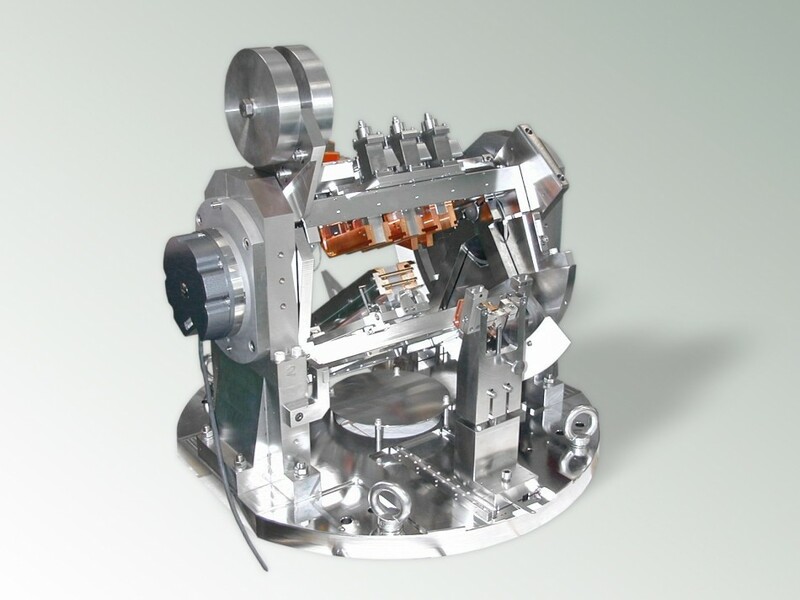 It is the task of the monochromator to realise the pitch movement of four gratings and to guarantee the exchange of the gratings. The gratings are arranged separately in highly precise and stable supports which are equipped with fine adjustment systems under vacuum. The silicon gratings are downwardly oriented and can perform a pitch rotation of approx. 20°. The exact positioning of the grating surface in the pitch axis is important. High–precision hybrid ball bearings will be used as bearing mechanism. For the exchange of the gratings the gratings will travel in a linear slide. 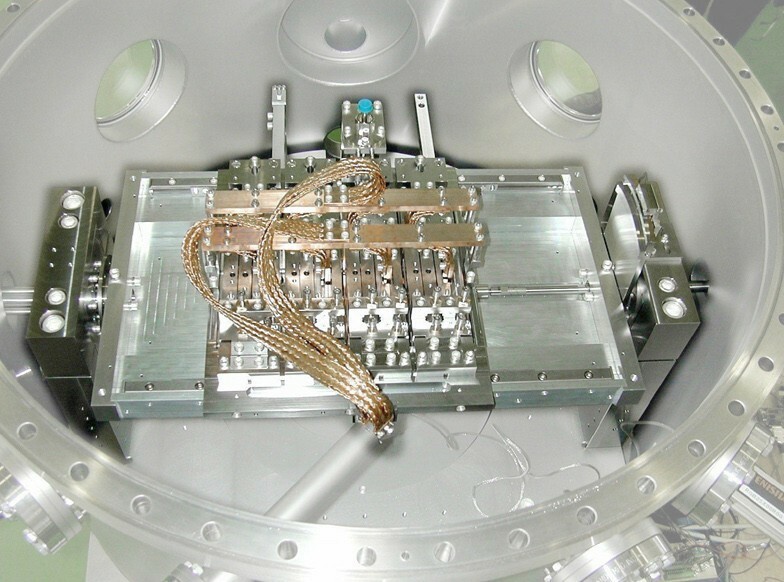 An optional pressure mechanism forces the respective active grating against a reference plate, so that a high repeatability of the grating position is achieved. 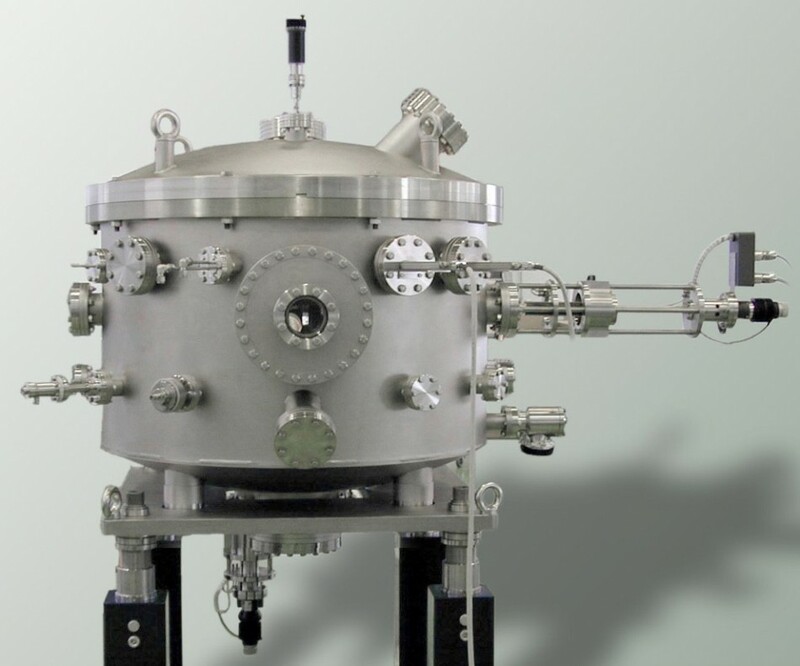 The pitching movement of the grating system is performed via a translatory movement which is transfered from the outside into the vacuum chamber via a membrane bellow. The motorization is outside the vacuum, the stepping motors can be combined with harmonic drive gears which will allow very high transmission ratios and thus the necessary angular resolution for the pitching movement. The exchange of the gratings will be performed via a translatory motion from the outside. The pitch and exchanging positions of the gratings are read via linear and angular encoders, which can be operated in vacuum. 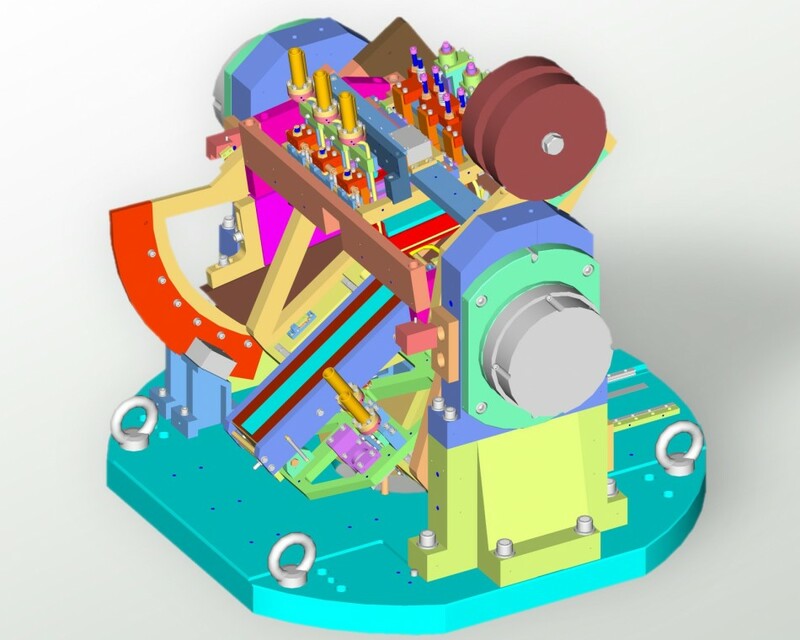 The entire grating mechanism is arranged on a very stable base plate which come from the outer main frame. 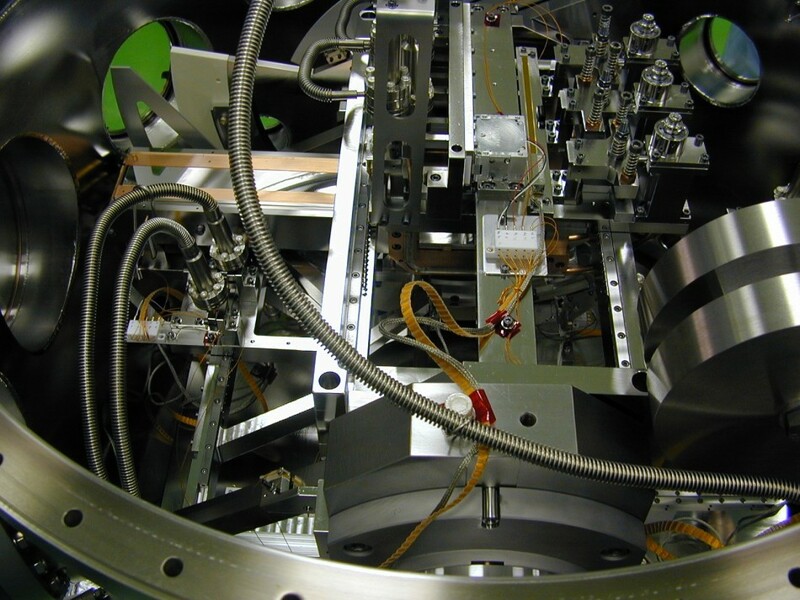 The monochromator frame consists of solid tubes which are welded to the floor base plate. 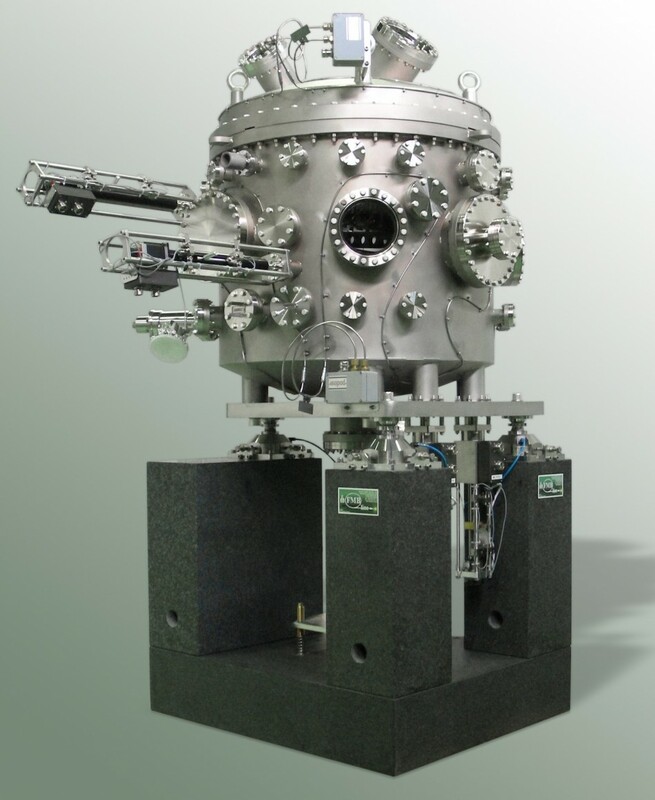 A sputtering ion pump (500 l/s) is used as a vacuum pump. 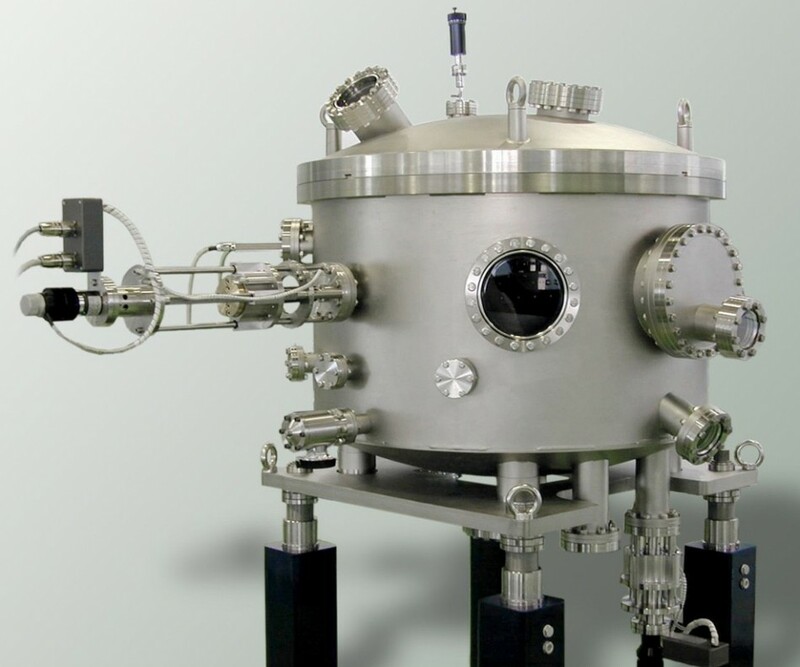 The vacuum chamber has a diameter of approx. 800 mm and is completely metal–sealed. All four gratings are fitted with lateral cooling plates. Cooling is performed using water.